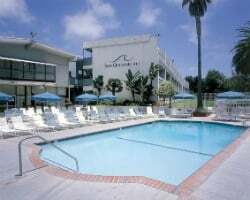 The *San Clemente Inn* is conveniently located halfway between Los Angeles and San Diego! 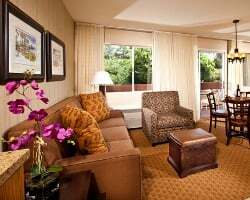 While allowing easy access to the best of what Southern California has to offer, San Clemente Inn is the perfect place to unwind at the end of a busy day. A short walk through the San Clemente State Park takes you to a ten-mile stretch of the most beautiful beach anywhere. You'll find lots of fine dining with breathtaking ocean views in the quaint 'Spanish Village by the Sea' and at neighboring Dana Point Harbor. 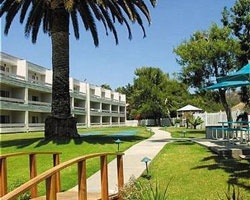 For more information about this beautiful resort, visit www.sanclementeinn.com. Avenida Del Mar Park nearby! From shopping to relaxing on the beach this resort has it all! Buyer may receive a title fee credit, inquire for details! Many onsite amenities! Make California your dream vacation each year! Buyer may receive a title fee credit, inquire for details! 2 weeks currently available! Motivated seller, willing to negotiate! Buyer May Receive A Title Fee Credit, Inquire For Details! Endless possibilities available! Enjoy any week at this year round resort! Buyer May Receive A Title Fee Credit, Inquire For Details! Annual floating week! Near a variety of attractions, entertainment & much more! Buyer May Receive A Title Fee Credit, Inquire For Details! Own a slice of Southern California! Yearly usage in floating, swing season week (Nov 1- Feb 3)! Lovely California retreat! Steal this for only $500!! Resort is close to the beach! Buyer May Receive A Title Fee Credit, Inquire For Details! Choose the week of your choice each year at this lovely resort! Buyer may receive a title fee credit, inquire for details! Terrific resort within walking distance from the San Clemente State Park & a 5-mile stretch of beach! Buyer may receive a title fee credit! Stunning retreat located between San Diego and Los Angeles! Buyer may receive a title fee credit, inquire for details! Floating red season week of your choice each year at this outstanding Southern California resort! Buyer may receive a title fee credit, inquire today! This is perfect for all your vacations to Southern California. Buy now for a bargain price! In close proximity to The Beach, Shops And Much More! Buyer May Receive A Title Fee Credit, Inquire For Details! Ideal resort location for enjoying Southern California! With RCI membership, week exchanges for 45,500 RCI points! Pick your vacation dates with a floating week! Inquire for details! Yearly Usage In Floating, High Season Wk! Buyer Pays All Closing Costs! All Fees paid! Owner is also selling AD#100199061, buy both for $10,000! 2019 week is booked from 7/28 - 8/4, seller willing to include it with the sale! Owner is also selling AD#100199060, buy both for $10,000! 2019 week is booked from 9/1 - 9/8, seller willing to include it with the sale! Resort features a variety of great activities & amenities for all ages! Don't miss out on a steal. Buyer may receive a title fee credit, inquire now! Enjoy vacationing close to dining, shops and the beach! Floating week! Inquire for more details! Week 26-- June 29th through July 6, 2019 available for rent! Don't miss out, book today! Buyer will have immediate use in 2018! With RCI membership week exchanges for 28,600 RCI points! Buyer may receive a title fee credit, inquire today! Beautiful resort in between San Diego and Los Angeles! Floating week! Buyer may receive a title fee credit, inquire for details!